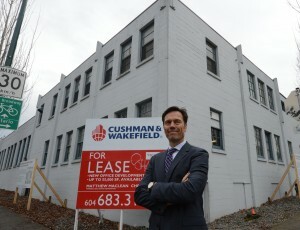 PC Urban’s new Lightworks building in Mount Pleasant has been featured in Business in Vancouver, The Vancouver Sun, Bisnow, RENX and Vancitybuzz this week. What made the story interesting was the fact that PC Urban Properties will be transforming an old, fairly non-descript industrial building, The Lightworks Building, into something innovative and unique to the neighborhood. It will become one of the city’s rare industrial heritage buildings to be re-imagined and preserved, providing state-of-the-art office and retail space in a area with nominal, if any, supply, and nothing newly-constructed or of this quality. But beyond the site’s architectural significance, the new 54,000 square foot, 6-storey Lightworks Building is part of the return of urban manufacturing to this neighborhood. It houses the history of the area’s transformation from resource economy to a mecca for creative industries, a change that has made Vancouver the top-performing economy in Canada. To read some of the coverage, click here.